Miami, FL (30 May 2018): Investors, Owners, Developers, Consultants, Hotel Executives and Government Tourism Officials recently gathered together in Miami to discuss the current and future state of the Caribbean hospitality industry. During the summit, the International Society of Hospitality Consultants (ISHC), the leading source for global hospitality expertise, in partnership with the Caribbean Hotel & Resort Investment Summit (CHRIS) took time out to celebrate and recognize a young leader who has already made a big impact in the Caribbean. 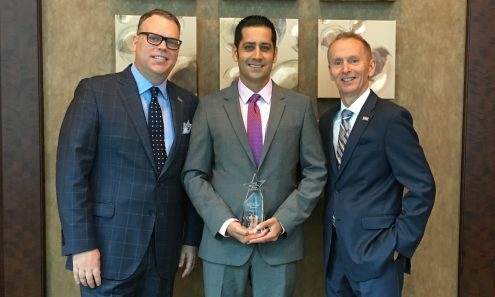 Saul Nunez Tirado received the honorable 2018 Rising Star Award Caribbean and was acknowledged by industry leaders in the Caribbean during the plenary session at CHRIS. Saul began his career at 8 years old working in his parent’s restaurant as a dishwasher. He got his first start in hotels in the Entertainment Department, working his way up to Rooms Division and being part of the pre-opening team for 5 different hotels. Today he is the General Manager of the beautiful Zoëtry Montego Bay Jamaica for which he has just accomplished the milestone of getting 4 diamonds by Triple A awarded to his hotel. Caribbean Hotel & Resort Investment Summit (CHRIS) is the Caribbean’s most important hotel and tourism investment conference. The conference immediately follows a second important event, the Hotel Opportunities Latin America (HOLA) conference. The back-to-back nature of the two events provides a venue for the hotel investment community that is interested not only in the Caribbean, but also in Latin America, to conduct their business while in Miami. CHRIS and HOLA are produced by Northstar Travel Group in association with Burba Hotel Network (BHN).